 From Riva Valdobbia, by following the road for Val Vogna where you will reach the Ca' di Janzo village; you will have to leave your car here and then proceed on foot passing the small villages of Ca' Piacentino ,Ca' Morca and Ca' Verno and finally S. Antonio. The beginning of the trail starts from the S. Antonio refuge and restaurant; you will follow along, by means of gentle rolling hills, into the valley on a dirt road and coast along the gulley of the Vogna stream. After about a 20 minute walk, on the right starts the n. 202 trail heading for the Alpe Rissuolo , the Rifugio Abate Carestia mt.2201, and the Corno Bianco . Following below the high villages of the Val Vogna , the road leads to the Peccia village, where you will find the old and newly restored S. Grato Oratory. Beyond the little church, you will find the Ponte di Napoleone (Napoleon's Bridge), made of stone and built by Napoleon's soldiers in the 1800s (later re-built), making it possible to cross the clear waters of the Solivo stream. Leaving on the left-hand side the way leading to the Maccagno Pass mt.2495, the trail follows along on the right, climbing up for the first part until the Alpe Montata , then follows along in the woods until reaching the stupendous alpeggio del Larecchio (pasture). It takes about 2 hours to reach this magnificent plain. Following from Alpe Larecchio mt.1895 , it is possible to push yourself until the Ospizio Sottile, a very sunny and tortuous trail taking you in about an hour and a half to the Colle Valdobbia , bordering with the Valdostano side.